Corrosion is an important factor when considering the use of metals. Steel is a versatile material such that it is employed in many industries for a wide range of applications. However steel is particularly vulnerable to corrosion with red rust forming readily in most external environments. However, the use of steel products in corrosive environments is made possible by the use of zinc to provide a high level of corrosion protection at an economic cost. Galvanic corrosion (also commonly termed bimetallic corrosion) is an electrochemical process. That is to say, it occurs as a result of the flow of very small electric currents usually between two dissimilar metals which causes the more anodic of the two metals to corrode, the noble or cathodic metal being unaffected. The current flows as a potential difference exists either between the two pieces of metal or between the different parts of the same metal, and an electrolyte such as moisture is present at the contact point. The need for the presence of moisture during the corrosion process is demonstrated by the fact that in very dry climates, e.g., in certain parts of India and Africa, iron articles of great antiquity have been found in a very good state of preservation. Since most corrosion is an oxidation process, the existence of a steady supply of oxygen at the surface of the metal is also necessary for corrosion to occur. An exception to the necessity for the two metals to be in electrical contact for bimetallic corrosion to occur is when a more noble metal corrodes slightly and dissolves in water that subsequently flows over a less noble metal. 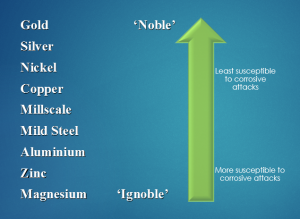 The more noble metal may then deposit on the less noble metal, thus forming a true bimetallic contact. The severity of bimetallic corrosion is dependent on the metals involved (see metal corrosion), their relative surface areas and the conductivity of the electrolyte present. Generally the level of bimetallic corrosion will normally be greater in an immersed than an atmospheric environment. For example in an atmospheric environment the level of bimetallic corrosion will be low if the ratio of the surface areas for anodic and cathodic metals is low and/or if the frequency or period of dampness (e.g. presence of an electrolyte) is low. Conversely if different metals are immersed in an electrolyte of increased conductivity such as sea water the level of bimetallic corrosion will be substantially greater. While immersion in fresh water which is less conductive would have a more significant effect than atmospheric exposure (see atmospheric corrosion) it would be less detrimental than immersion in sea water. Similarly, a film of moisture condensed from the air can, like rain water, dissolve contaminants and provide conditions for bimetallic corrosion to take place. Use of an insulating material between the dissimilar metals such that they are not in direct electrical contact. This effectively breaks the electrical circuit so the current can not flow. Preventing the electrolyte from bridging across the two metals. Under immerse conditions option 1 may be possible if insulation is not precluded by a need for electrical bonding. For example a zinc-coated steel nut and bolt may be fitted with an insulating bush and washers where it passes through a steel plate if that cannot be coated. Complete insulation is essential in such a case and therefore the bush is vital. Option 2 may be achieved by the application of paint or other organic coating to the immersed part of the metal. Where protection is sought by this means and it is impracticable to coat both metals it is preferable to coat the more noble metal e.g. the coating is not normally applied to the zinc coating. Jointing compounds should be able to exclude water, should not dry or crack and should not be corrosive. If formulated with an adequate corrosion inhibitor (see rust prevention), they may suffice for moderate conditions, but subsequent painting may be advisable. Jointing compounds may also protect against crevice corrosion. The application to the assembled joint of an overall paint or powder coating metal system, suitable for the specific environment, is effective. The combination of a jointing compound and subsequent painting is better than either alone. Thick, water-resisting plastics or mastic coatings, where they can be used, are useful.